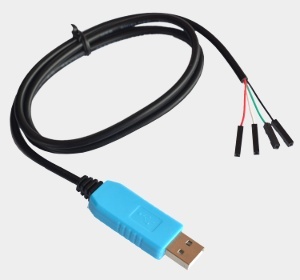 A DS9097 compatible 1–wire bus master with USB connection based on PL-2303TA serial interface for connecting one or more 1–wire devices to a PC. Works under Linux and Windows XP SP2, Vista, 7, 8, 8.1 and 10. Supported by third-party tools: Digitemp, LogTemp, pydigitemp (python library), owfs (as passive) and OneWireViewer. A 1–wire temperature sensor DS18B20, Temperature & A/D Battery Monitor DS2438 (0x26), and 1–wire serial number IC DS2401 can be connected directly to du-pont cable ends. In this cases no pull-up resistor is needed.